We keep hearing about austerity measures being implemented in countries all over the world, desperately trying to reign in spending to combat enormous, out-of-control budget deficits and national debt. Not only is America slithering dangerously toward a double-dip recession, but so is nearly all of Europe. Even Europe’s strongest core economies — Germany, France, and the Netherlands — are being pummeled with bad news and contracting in response. So what do the leaders of these countries do? Cut! Slash! Impose radical austerity measures immediately! But who do we see those austerity measures NOT being imposed upon? The people who are imposing them! We have the members of Congress – who are paid an average of $186,375 per year plus a $491,000 benefits package – indignantly raging against “wasteful government spending” and demanding that assistance programs for America’s poverty-stricken need to be slashed and gutted; they insist that pay and benefits for America’s teachers, and firemen, and police officers, and paramedics, are all bloated and are nested at the very root of America’s financial crisis. Does any one of them have the integrity or sense of sacrifice they demand of others to step up and suggest that THEIR pay and benefits be cut? Don’t be ridiculous … how can we get “the best and brightest” into Congress unless they’re grotesquely overpaid and excessively benefitted? Think about the U.S. Congress right now from a performance/merit perspective. Can you honestly say that there’s a single one of them who is rightfully EARNING their paycheck and those ludicrous perks and 14 weeks of paid vacation per year? Yesterday, Republican presidential hopeful Newt Gingrich (the GOP’s own non-rebel-without-a-clue) raged against “Washington elitism” and how the influence of mega-wealth, extravagance, opulence and arrogance was literally at the heart of America’s financial struggle. The fact that Gingrich released that “rage” at a $25,000-per-plate fundraiser luncheon in the Grand Ball Room of the Heritage Foundation national headquarters, which just happens to be the largest and most well-funded lobbyist organization in the country … well, the irony and hypocrisy seems – as usual – to be lost on the far right fan base. We have Warren Buffet, arguably the wealthiest man in the world, saying flat-out that America needs to raise taxes on its wealthiest citizens. Does the rabid base of the far right-wing consider the source of that message? Do they stop to think, “Hmmmm … this guy makes more in an hour than I’ll make in my entire life. Maybe he knows more about economics than I do, or anyone I know does, or any of the campaign kewpie dolls kn ow”? No, they knee-jerk label him a “traitor” and “a stinking liberal” and wave their mis-spelled protest signs with demands that they’re too stupid to realize will only hurt themselves. Austerity, defined, means “a severe, drastic and hurtful practice or set of practices, reduced availability of luxuries and consumer goods, esp when brought about by government policy.” Couple that with the idiotic American spin on austerity of “everything needs to be cut … except *my* stuff,” and you’ve got a mathematically perfect formula for disaster. As any practicing economist who isn’t paid by one lobby group or another will tell you; cutting public spending when they should be spending more to counteract the drastic slowing of private spending is the WRONG way to go. The United States has been moving in the same bizarre direction as Germany, France and the Netherlands. Cutbacks by state and local governments have all but negated the federal government’s original stimulus, and there isn’t a soul in Washington or out on the campaign trail who is talking seriously about anything resembling a common-sense solution. The pathetic, purely party-before-country debacle two weeks ago over increasing the debt limit has produced precisely the opposite effect: a Rube-Goldberg-like process for capping spending rather than increasing it, and a public that’s being sold the Republican lie that less government spending means more jobs. The “job creators” have been given literally TRILLIONS OF DOLLARS IN TAX CUTS since 1982. And, thanks largely to the mass outsourcing of jobs courtesy of the dozens of loopholes in George W. Bush’s “Jobs for America” program, America has LOST MORE THAN 28 MILLION JOBS. Governments on both sides of the Atlantic are grossly in debt. But policy makers on both sides seem to have forgotten that economic growth is the most time-proven and effective solution. Public debt has meaning only in relation to a nation’s gross domestic product (GDP). When more people are working, more companies are profiting, and economies are expanding, revenues pour into national treasuries because people at ALL levels of that economy are CONTRIBUTING to that economy. When economies stop growing or contract, the opposite occurs. Economies descend into vicious cycles of slower growth, lower tax revenues, spending cuts and austerity programs … which lead to even slower growth. But politicians refuse to acknowledge that. Instead, they opt to shovel their partisan lies down their constituents throats and blindly ignore the facts that are right in front of them. Idiotic rhetoric has supplanted intelligent courses of action. Oh, the “job creators” have created jobs, alright. They’ve just created them in China and Singapore and Malaysia, where workers get 20 cents a day and no benefits, and … *gasp* … ever-so-amazingly, corporate profits have resultingly skyrocketed to unprecedented record levels. It’s gotten so out-of-hand that the fate of entire global currency systems can be changed by a whisper. Remember the scare two weeks ago that France was going to teeter on bankruptcy and that French financial institutions were going to be boycotted and denied credit from Chinese financial institutions, and we saw the Dow plummet 560 points? *ALL* of that was because of rumors that started by people who had read a series of FICTION ARTICLES in an obscure French newsletter. When growth is slowing so dra matically and unemployment is already high, monetary policy can’t possibly do it alone. Spending cuts alone won’t solve the problem. Raising taxes alone won’t solve the problem. THe INTELLIGENT solution, as anyone who doesn’t buy into the “my party is right and your party wants to destroy America” nonsense can tell you, MUST include a HEALTHY combination of BOTH. Yes, government spending on many entitlements (EXCEPT for Social Security, which has contributed NOT ONE RED CENT to the debt) is bloated and ineffectual and corrupt. But so is the wealth-worshipping cut-taxes-and-hoard mentality of the corpocratic-pandering right-wing and their self-defeating retarded cousins in the TEA party. Without an *expansionary* fiscal policy that initiates and promotes growth, low interest rates don’t mean squat. What difference does a low interest rate make if nobody can get a loan? Companies won’t borrow in order to expand and hire more workers unless they have reasonable certainty that there will be customers to buy their products. Consumers won’t borrow money to spend on goods and services unless they’re reasonably confident they’ll have jobs. And the current political mindset of “pretend that neither one of those factors is actually happening and instead focus on wedge issues like abortion and gay marriage” is about as stupid an approach as there can be. Austerity literally forces countries to destroy their own infrastructure – as well as their opportunities – from within. It’s a snake eating itself. 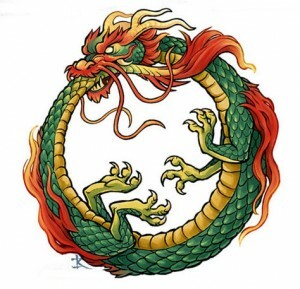 We are now, functionally, the United States of Ouroboros. And if America doesn’t wake up VERY soon and FORCE it’s government to SERVE America instead of themselves, that snake will quickly devour itself entirely, until there’s literally nothing left … for anyone. Excellent submit. Quite informative read right here. Thanks for sharing and that I’ll be back again soon to check out much more posts from you. Cheers!Good work,hope your blog be better!I just want to make a blog like this!